The European green crab is one of the world's most successful aquatic invaders (Darling et al 2008). It is a voracious omnivore with a wide tolerance for salinity variation, water temperature and habitat types (Klassen & Locke, 2007). It has primarily been characterized as a molluscan predator (DeGraaf & Tyrrell, 2004). This species has a larval stage that typically includes four zoeal stages and a megalopa stage. It is a medium sized crab, being more broad than it is long. In its adult size it can get up to about 6 cm in length and 9 cm wide. It has a thorax granulate with five lateral spines about equal in size on either side of the rostrum. The sides of the thorax contain silky hair. The orbit subovate is an obtuse tooth beneath the anterior canthus. The rostrum protrudes with three very obtuse subequal teeth, with the middle tooth being the smallest. The body and feet are spotted with brown and covered with minute, crowded granules; those on the thorax are more conspicuous. The spots of the feet and abdomen are impressed and placed in more or less obvious lines. The chelae are large and slightly unequal with the second and third joint ciliate before. The carups is acutely spined within having no spine on the opposite edge. The hand is convex on the back, with an elevated line above on the inner side. The fingers are striate with impressed lines, about four on the thumb, not falcate at tip. The second to fourth walking legs are about equal, and the fifth leg is more compressed with a dactyl that is wider but not spatulate as in other Portunidae. The abdomen of the male is triangular, and the somites 3-5 are fused (Klassen & Locke, 2007). This species is a poikilotherm, thus physiology and behavior are affected by daily and seasonal temperature variations. The green crab is capable of producing eggs at temperatures up to 26 degrees Celsius but larval development is limited to a narrower range. In addition, green crabs are considered reasonably tolerant of oxygen stresses (Klassen & Locke, 2007). Larval stages include Protozoea, Zoea (4 stages) and Megalopa. The lifespan of females is about 3 years, while it is about 5 years for males. Larvae are not as tolerant to temperature, salinity, or starvation as adults which may be the limiting factor in the ability to become established in new habitats. Suboptimal salinity can result in delays in larval development (Bravo, 2007). This species has been proven to grow faster and achieve larger maximum size on the Pacific coast of North America than they do on the Atlantic coast of North America and in their native range (Gillespie et al 2007). Molting, and consequently growth is affected by food availability and seasonal temperature fluctuation with 10 degrees Celsius indicated as an important thermal barrier (Klassen & Locke, 2007). In native ranges of Europe, Carcinus maenas has been fished commercially for years (Klassen, 2007). In addition, this species has been recommended as an indicator species for the monitoring of heavy metal contamination because heavy metal pollution has been associated with respiratory failure in crabs (Klassen & Locke, 2007). While in its native range, this species is considered an important scavenger, especially of commercial fishery discards (Klassen & Locke, 2007). Adult Carcinus maenas can tolerate temperatures ranging from 0 to 33°C, salinities from 4 to 54, starvation for up to 3 months, and air exposure in damp burrows for up to 10 days (Bravo, Cameron & Metaxas, 2007). Larvae have narrower temperature tolerances and there is evidence that some have not been able to survive when cultured at 6 and 25 degrees Celsius (deRivera et al 2007). As this species increases in age, it begins to occupy more of a variety of substrates such as mud, sand, rock, and eelgrass. It can also occupy depths ranging from high tide to 6 meters, and there have even been records of up to 60 meters (Breen & Metaxas, 2008). The expansion and contraction of this species along the northern limit along the western Atlantic has coincided with short-term temperature changes, suggesting that cold water temperature determines the northernmost limit of the species (deRivera et al 2005). In Europe, the green crab's entire reproductive cycle usually lasts about a year. However, gonadogenesis may occur twice a year in the case of large females. Individuals usually mate once a year during the midsummer to early-fall period. Reproductive strategies may differ among newly invaded coastlines (Audet et al 2008). This species preys on large and small snails with a preference for the smaller snails (Eastwood et al 2007). In addition, soft-shell clams are a significant prey item for the European green crab (Floyd & Williams, 2004). The European green crab is also a major predator on clams, mussels, juvenile fishes and other species in natural settings and in aquaculture (Gillespie et al 2007). The transport vectors implicated in the events of introduction of this species include natural dispersal, solid ballast, hull and equipment fouling, ballast water, and contaminated packing material shipped with commercial shellfish (Darling et al 2008). Recommended citation: Global Invasive Species Database (2019) Species profile: Carcinus maenas. Downloaded from http://www.iucngisd.org/gisd/species.php?sc=114 on 22-04-2019. Carcinus maenas is a voracious predator. It is able to crush mussels and shows a clear potential to negatively threaten mussel farms. In its native range, as well as in invaded regions, this species has been considered responsible for significant impacts on epibenthic and infaunal species, such as bivalves, other mollusks, and crustaceans, through predation, competition, and burrowing activities (Bravo, 2007). This species competes with other decapods for food or structure as well as resource competition, which may affect their geographic distribution (deRivera et al, 2005). The collapse of the soft-shell clam industries, in both New England and Nova Scotia, have been attributed to this species, which is causing concern for other local fisheries and economies (Breen & Metaxas, 2008). In the United States alone, C. maenas causes approximately $22 million dollars worth of damage each year (Williams, 2008). In areas in which the green crab has been introduced, it has the potential for significant impacts on fisheries, aquaculture, and the ecosystem. In fact, numerous studies have shown the potential for green crab to adversely affect many ecosystem components, directly and indirectly, by predation, competition and habitat modification (Klassen & Locke, 2007). This species has been documented as being a potential facilitator of Styela, which is an invasive club tunicate is some areas. They could facilitate the invasions by preying on tunicate predators. Green crabs are known to comsume prey from at least 158 genera and have been widely documented to decrease the diversity and biomass of estuarine communities (Locke et al 2007). Prevention: Block anthropogenic pathways. Vectors such as ballast water accelerate the transport of populations into areas, and slowed expansion times can provide significant economic benefits (Klassen & Locke, 2007). Physical: constructing local physical barriers such as fences, rafts and nets may help to keep crabs in a controlled area. Also altering fishing practices may be helpful. For example, overwintering seed so that it is larger when planted and in closed areas. In addition, manual removal, commercial harvesting, trapping, and parasitic castrators are all possible options for control (Klassen & Locke, 2007). Biological: A crab native to North America, Callinectes sapidus has been proven to have a significant effect on the abundance of this species, having increasing effects at the southern end of the range (deRivera, Ruiz, Hines & Jivoff, 2005). The Asian shore crab, Hemigrapsus sanguineus, has a negative influence on the mussel consumption of the European green crab and thus, its resulting growth rates. The Asian shore crab also affects this species by consuming settling post-larvae and displacing juveniles from their refuge habitat under rocks (Griffen, Guy & Buck, 2008). Another possibility is to utilize biological control by \"guarding\" bivalve seed using the toadfish, Opanus tau. (Klassen & Locke, 2007). The parasitic barnacle, Sacculina carcini is a potential biocontrol agent for introduced C. maenas populations. However laboratory host specificity testing of native California crabs showed that S. carcini larvae settled on, infected and killed all four of the native crab species tested. However the infection process was different in native crabs and S. carcini was not able to fully mature and produce reproductive sacs in native crabs, in contrast to C. maenas. Goddard et al emphasise the importance of weighing up the potential benefits of using S. carcini as a biological control agent, with the potential non-target impacts (Goddard et al. 2005). \r\nOther biocontrol agents may have the potential to control green crabs, which include the parasitic isopod Portunion maenadis, the flatworm Fecampia erythrocephala and the egg predator Carcinonemertes carcinophila. However more information is needed on the host specificity and life history characteristics of these natural enemies (Goddard et al. 2005). Informations on Carcinus maenas has been recorded for the following locations. Click on the name for additional informations. Cohen, A. N. and Carlton, J. T. 1995. Nonindigenous aquatic species in a United States estuary: A case study of the biological invasions of the San Francisco Bay and Delta. United States Fish and Wildlife Service, Washington D. C. and the National Sea Grant College Program: 246. Delaney, David G; Sperling, Corinne D; Adams, Christiaan S; Leung, Brian., 2008. Marine invasive species: validation of citizen science and implications for national monitoring networks. Biological Invasions. 10(1). JAN 2008. 117-128. Gillespie, G. E; Phillips, A. C.; Paltzat, D. L.; Therriault, T. W., 2007. 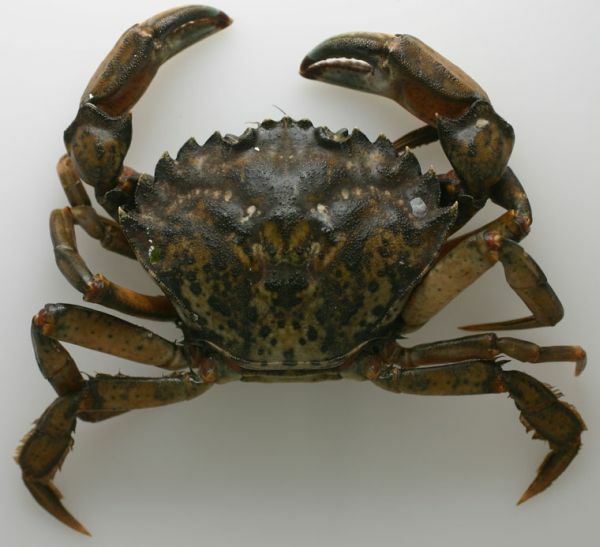 Canadian Technical Report of Fisheries and Aquatic Sciences 2700 - Status of the European Green Crab, Carcinus maenas, in British Columbia-2006. Canadian Technical Report of Fisheries & Aquatic Sciences. 2700 2007. 1-37,39,VI. Goddard, J.H.R., Torchin, M.E., Kuris, A.M. & Lafferty, K.D. 2005. Host specificity of Sacculina carcini, a potential biological control agent of the introduced European green crab Carcinus maenas in California. Biological Invasions 7: 895-912. Klassen, G. and A. Locke. 2007. 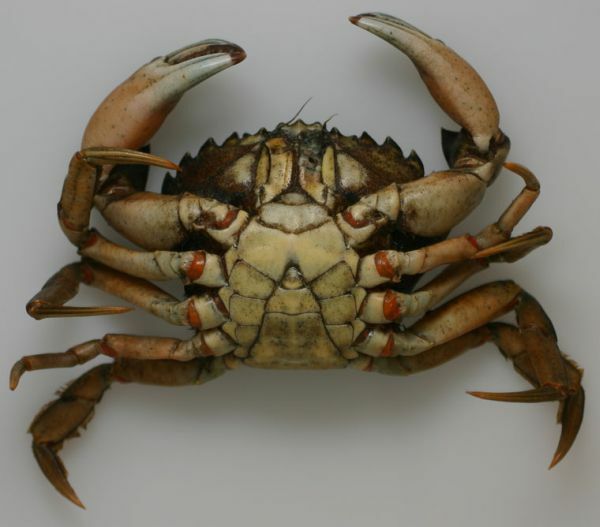 A biological synopsis of the European green crab, Carcinus maenas. Can. Manuscr. Rep. Fish. Aquat. Sci. no. 2818: vii+75pp. Locke, Andrea; Hanson, J. Mark; Ellis, Karla M.; Thompson, Jason; Rochette, Remy., 2007. Invasion of the southern Gulf of St. Lawrence by the clubbed tunicate (Styela clava Herdman): Potential mechanisms for invasions of Prince Edward Island estuaries. Journal of Experimental Marine Biology & Ecology. 342(1, Sp. Iss. SI). Mar 26 2007. 69-77. Paille, N.; Lambert, J.; Simard, N.; Pereira, S., 2006. The green crab (Carcinus maenas): literature review and current status in the Magdalen Islands. Canadian Industry Report of Fisheries & Aquatic Sciences. 276 2006. 1-36,VI. Williams, Susan L.; Grosholz, Edwin D., The invasive species challenge in estuarine and coastal environments: Marrying management and science. Estuaries & Coasts. 31(1). FEB 2008. 3-20. Yamada, Sylvia Behrens and Laura Hauck., 2001. Field Identification of the European Green Crab Species Carcinus maenas and Carcinus aestaurii. Journal of Shellfish Research Vol 20 No 3. 905-912 2001. Yamada, Sylvia Behrens; Gillespie, Graham E., 2008. 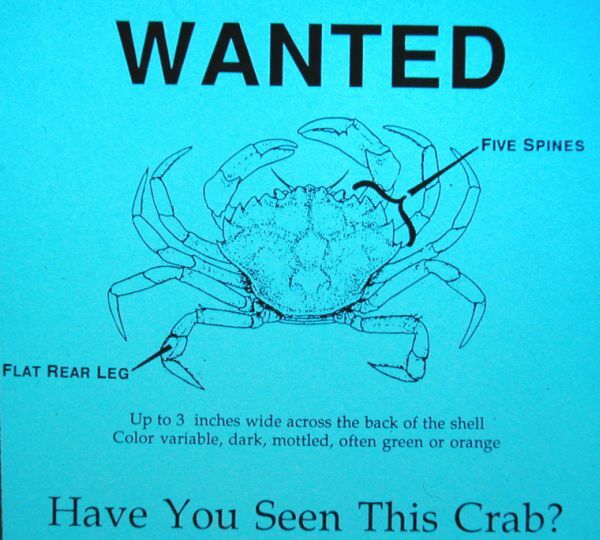 Will the European green crab (Carcinus maenas) persist in the Pacific Northwest? ICES Journal of Marine Science. 65(5). JUL 2008. 725-729. Audet, Dominique; Miron, Gilles; Moriyasu, Mikio, 2008. 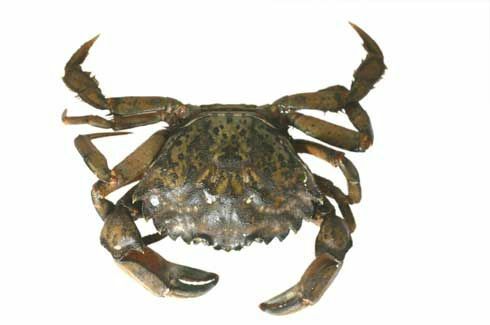 Biological characteristics of a newly established green crab (Carcinus maenas) population in the southern Gulf of St. Lawrence, Canada. Journal of Shellfish Research. 27(2). APR 2008. 427-441. Behrens Yamada, S., and Gillespie, G. E. 2008. 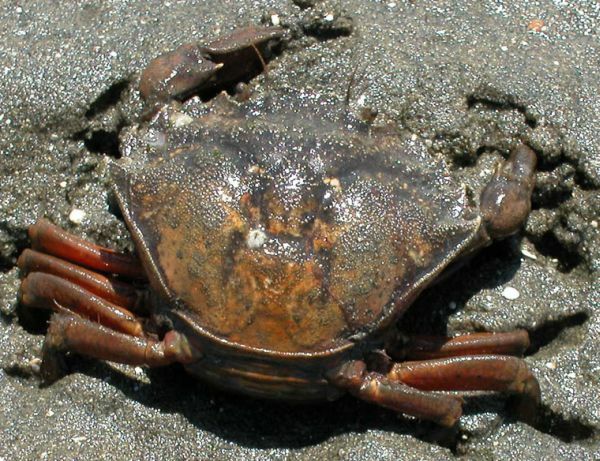 Will the European green crab (Carcinus maenas) persist in the Pacific Northwest? � ICES Journal of Marine Science, 65. Bravo, Monica A.; Cameron, Beth; Metaxas, Anna., 2007. Salinity tolerance in the early larval stages of Carcinus maenas (Decapoda, Brachyura), a recent invader of the Bras d Or Lakes, Nova Scotia, Canada. Crustaceana (Leiden). 80(4). APR 2007. 475-490. Breen, Erin; Metaxas, Anna., 2008. A comparison of predation rates by non-indigenous and indigenous crabs (Juvenile Carcinus maenas, juvenile Cancer irroratus, and adult Dyspanopeus sayi) in laboratory and field experiments. Estuaries & Coasts. 31(4). SEP 2008. 728-737. Cohen, A. N., Carlton, J. T. and Fountain, M. C. 1995. Introduction, dispersal and potential impacts of the Green Crab Carcinus maenas in San Francisco Bay, California. Mar. Biol. 122: 225-237. Darling, John A.; Bagley, Mark J.; Roman, Joe; Tepolt, Carolyn K.; Geller, Jonathan B., Genetic patterns across multiple introductions of the globally invasive crab genus Carcinus. Molecular Ecology. 17(23). DEC 2008. 4992-5007. DeGraaf, James D. and Tyrrell, Megan C., 2004. Comparison of the Feeding Rates of Two Introduced Crab Species, Carcinus maenas and Hemigrapsus sanguineus, on the Blue Mussel, Mytilus edulis. Northeastern Naturalis, Vol. 11 No. 2 (2004), pp. 163-166.
deRivera, Catherine E; Hitchcock, Natasha Gray; Teck, Sarah J.; Steves, Brian P.; Hines, Anson H.; Ruiz, Gregory M., Larval development rate predicts range expansion of an introduced crab. Marine Biology (Berlin). 150(6). MAR 2007. 1275-1288.
deRivera, Catherine E.; Ruiz, Gregory M.; Hines, Anson H.; Jivoff, Paul., 2005. Biotic resistance to invasion: Native predator limits abundance and distribution of an introduced crab. Ecology (Washington D C). 86(12). DEC 2005. 3364-3376. Eastwood, Meg M; Donahue, Megan J.; Fowler, Amy E., Reconstructing past biological invasions: niche shifts in response to invasive predators and competitors. Biological Invasions. 9(4). JUN 2007. 397-407. Edgell, Timothy C.; Rochette, Remy., 2008. Differential snail predation by an exotic crab and the geography of shell-claw covariance in the northwest Atlantic. Evolution. 62(5). MAY 2008. 1216-1228. Griffen, Blaine D.; Guy, Travis; Buck, Julia C., 2008. Inhibition between invasives: a newly introduced predator moderates the impacts of a previously established invasive predator. Journal of Animal Ecology. 77(1). JAN 2008. 32-40. Grosholz, E. D. and Ruiz, G. M. 1995. Spread and potential impact of the recently introduced European green crab, Carcinus maenas, in central California. Marine Biology 122: 239-247. Hampton, S. L; Griffiths, C. L., 2007. Why Carcinus maenas cannot get a grip on South Africa s wave-exposed coastline. African Journal of Marine Sciences. 29(1). May 2007. 123-126. Hidalgo, Fernando J.; Silliman, Brian R.; Bazterrica, Maria Cielo; Bertness, Mark D., 2007. Predation on the rocky shores of Patagonia, Argentina. Estuaries & Coasts. 30(5). OCT 2007. 886-894. Jensen, Gregory C; McDonald, P. Sean; Armstrong, David A., 2007. 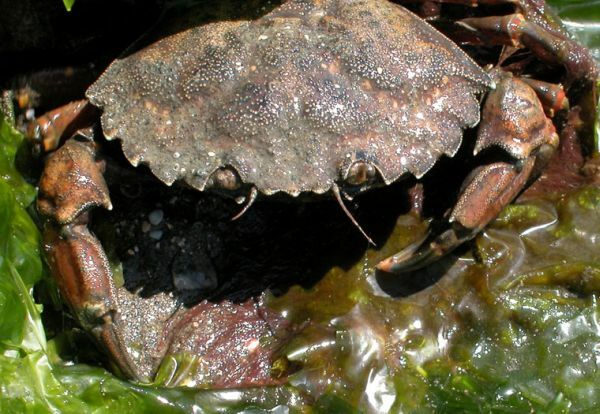 Biotic resistance to green crab, Carcinus maenas, in California bays. Marine Biology (Berlin). 151(6). JUL 2007. 2231-2243. Le Roux, P. J., Branch, G. M. and Joska, M. A. P. 1990. 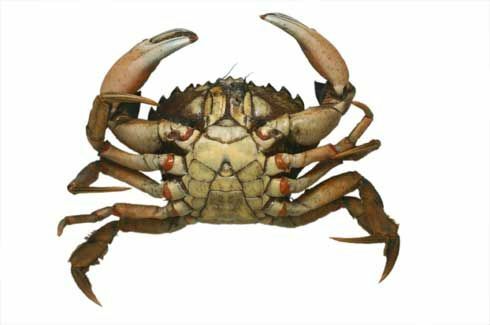 On the distribution, diet and possible impact of the invasive European shore crab Carcinus maenas (L.) along the South African coast. South Afr. J. Mar. Sci. 9: 85-93. MacDonald, James A.; Roudez, Ross; Glover, Terry; Weis, Judith S., 2007. The invasive green crab and Japanese shore crab: behavioral interactions with a native crab species, the blue crab. Biological Invasions. 9(7). Oct 2007. 837-848. Mark E. Torchin, Kevin D. Lafferty & Armand M. Kuris., 2001. Release from parasites as natural enemies: increased performance of a globally introduced marine crab. Biological Invasions 3: 333�345, 2001. Miron, Gilles; Audet, Dominique; Landry, Thomas; Moriyasu, Mikio., 2005. Predation potential of the invasive green crab (Carcinus maenas) and other common predators on commercial bivalve species found on Prince Edward island. Journal of Shellfish Research. 24(2). AUG 2005. 579-586. Roman, Joe., 2006. Diluting the founder effect: cryptic invasions expand a marine invader s range. Proceedings of the Royal Society Biological Sciences Series B. 273(1600). OCT 7 2006. 2453-2459. Rossong, M. A.; Williams, P. J.; Comeau, M.; Mitchell, S. C.; Apaloo, J., 2006. Agonistic interactions between the invasive green crab, Carcinus maenas (Linnaeus) and juvenile American lobster, Homarus americanus (Milne Edwards). Journal of Experimental Marine Biology & Ecology. 329(2). FEB 21 2006. 281-288. Roudez, Ross J.; Glover, Terry; Weis, Judith S., 2008. Learning in an invasive and a native predatory crab. Biological Invasions. 10(8). DEC 2008. 1191-1196. Tanner, Jason E., 2007. The influence of introduced European green crabs (Carcinus maenas) on habitat selection by juvenile native blue crabs (Portunus pelagicus). Estuaries & Coasts. 30(4). AUG 2007. 601-606. Tyrrell, M. C & Harris, L. G., ???. Potential impact of the introduced Asian shore crab, Hemigrapsus sanguineus, in northern New England: Diet, feeding preferences, and overlap with the green crab, Carcinus maenas. Marine Bioinvasions. Proceedings of the First National Conference. pp. 208-210. Tyrrell, Megan C.; Guarino, Patricia A.; Harris, Larry G., 2006. Predatory impacts of two introduced crab species: Inferences from microcosms. Northeastern Naturalist. 13(3). 2006. 375-390. Vinuesa, Julio H., 2007. Molt and reproduction of the European green crab Carcinus maenas (Decapoda : Portunidae) in Patagonia, Argentina. Revista de Biologia Tropical. 55(Suppl. 1). JUN 2007. 49-54.